At least 25 Palestinians were killed on Thursday in fresh Israeli air strikes targeting over 300 Hamas positions, taking the death toll to 64 in the deadliest escalation in the region since November 2012. Gaza medical officials claimed that half of the total casualties in three days of offensive were civilians, including women and children. Eight Palestinians were killed in an air raid on a house near the southern town of Khan Younis early on Thursday, the Palestinian health ministry said. In another attack, a cafe in the same area was hit, killing nine people. Three people also died in an Israeli strike on a car in western GazaCity. An Israeli military spokesman said the deaths at the house in Khan Younis were "a tragedy - not what we intended", as people had returned to the building too soon following a telephone warning. The Israel Defence Forces said that the home was the residence of Odeh Kaware, Hamas' Khan Younis company commander, and served as his headquarters. Palestinian sources said 25 people were also wounded in the strikes on the house. 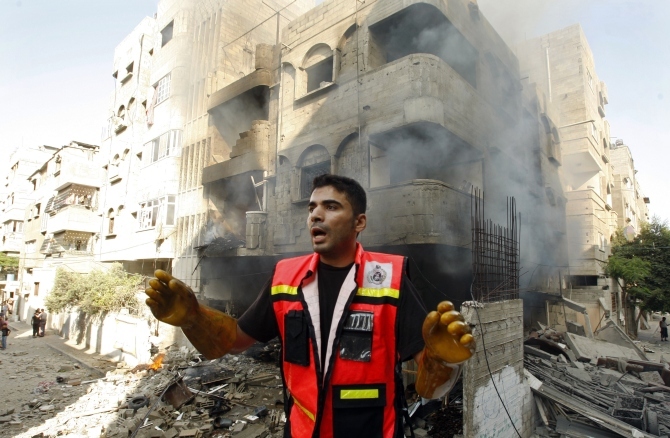 Image: A member of the civil defence reacts after what police said was an Israeli air strike on a house, in Gaza City. 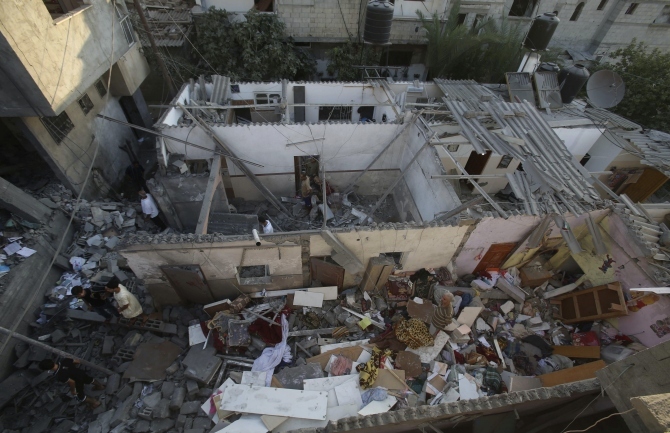 Irrespective of the tragedy, a high-ranking IDF officer was quoted as saying that the Israeli army would continue to bomb the homes of senior Hamas operatives, adding that even though the air force realises that sometimes residents of a targeted building try to prevent the bombings by standing on the roof as human shields. "We will take down those houses," he reportedly emphasised. 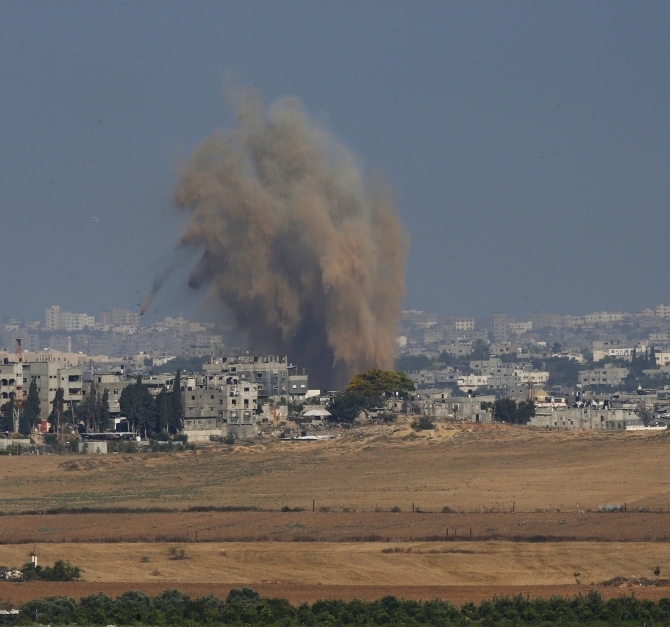 At least 64 people, including, 10 women and 18 children, have been killed since the Israeli army launched Operation Protective Edge to silence Hamas rocket attacks. Image: Palestinians inspect a house, which police said was damaged in an Israeli air strike on a neighbouring house, in Khan Younis in the southern Gaza Strip. More than 750 targets have been attacked in Gaza with the help of about eight hundred tonnes of explosives. Roughly 300 rockets, including some with a range of more than a 100 kms, were fired on Israel. Meanwhile, rocket sirens sounded in Tel Aviv again on Thursday morning as the Israeli military. The sirens in Tel Aviv were immediately followed by a series of audible explosions, most likely the Iron Dome interception system which picked off the rockets as they were heading toward the area. An IDF spokesperson said the Israel air force had struck 320 targets in Gaza over the past 24 hours, she said. 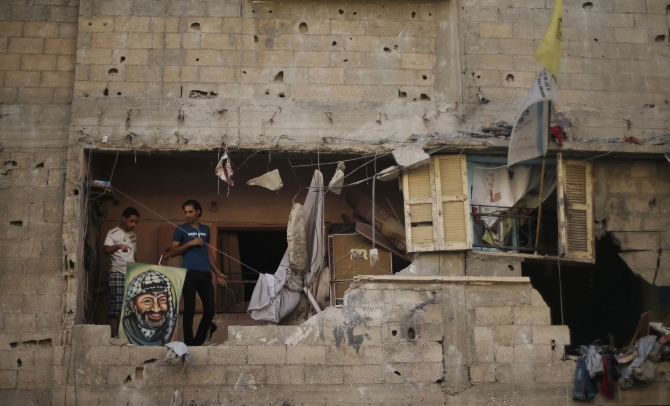 Image: Palestinians stand next to a picture depicting late Palestinian leader Yasser Arafat as they inspect a house which police said was damaged in an Israeli air strike in Gaza City.